People who buy new cars typically buy them under the impression that they should work perfectly fine as is, and be serviced under warranty. Not Mr. Westermeister though. While his new Fiesta ST, nicknamed “Finn,” has been a blast to drive, shifting the transmission was a bit of a letdown. The linkage was tight, but the throws were a little too long compared to the rest of the car’s sporty nature. With a whopping 300 miles on the odometer, it was decided that a short shifter was going to be installed. 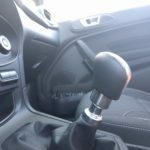 Perusing the web will garner all sorts of short shifter options for the FiST, but after doing a bit of homework, it was decided that an easily reversible solution was the best route to go on such a new car. 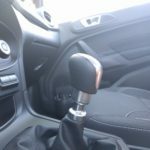 In the case of the front wheel drive Fiesta ST, short shift kits come in two flavors. There’s the kind that is fitted to the transmission itself, and then there’s the kits that are installed through removal of the car’s center console. Wes elected to go with the kit that installs on the transmission, because it would be a crime to rip apart a brand new interior devoid of squeaks and rattles. Enjoy the peace and quiet while you can! 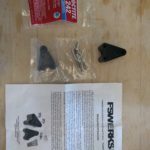 The short shift kit that was chosen for the job is produced by FSWERKS. For less than a Ben Franklin shipped to our door (and that includes CA sales tax), the FSWERKS kit provides a completely bolt-on solution for shorter shifts. Their kit uses two CNC machined pieces of aluminum that are sandwiched over the stock shift linkage, then the shifter cable simply snaps back on to the new pivot location. As mentioned earlier, this is completely reversible should Wes want to go back to stock at any time. The kit comes with a total of seven pieces: (2) aluminum shifter plates, (3) Allen/Hex key bolts, (1) threaded shifter cable ball pivot, and (1) tube of Blue Loctite. There are a set of instructions that come with the kit that are fairly straight forward, but a little reading online helped us streamline the process. Install took us about 20 minutes. 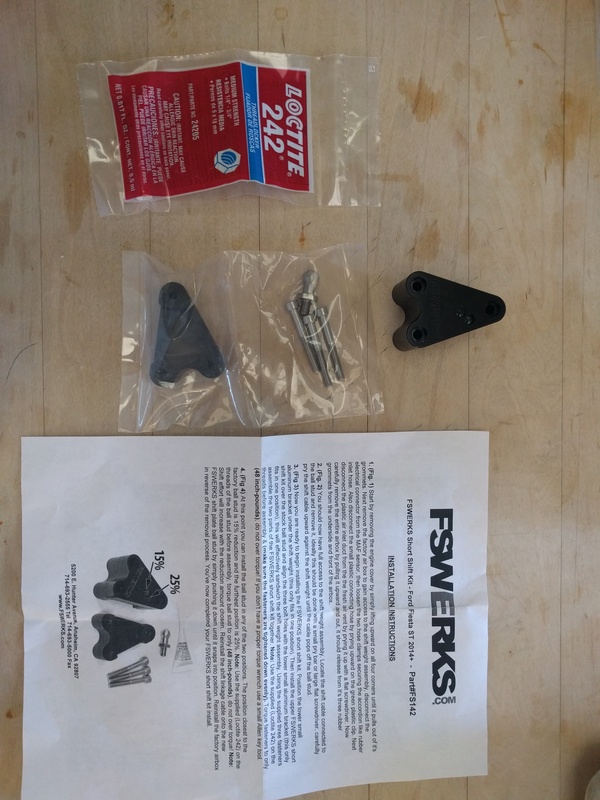 The FSWERKS Fiesta ST kit components. The three bolts use a 4mm Allen/hex key in case you don’t have one. The black piece tucked down low is the new short shifter assembly. Space is tight, so this is where small hands have the advantage. 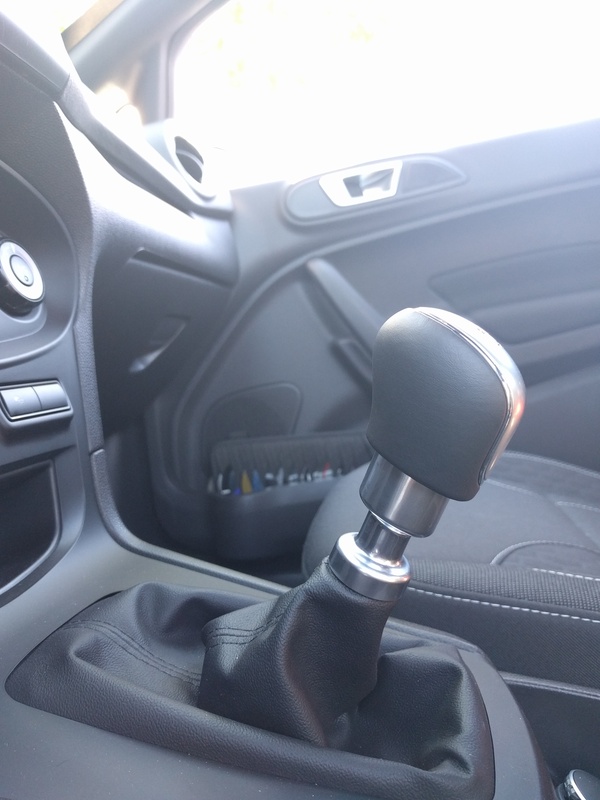 This is the shift lever in the neutral Position. This is the new position for 1st, 3rd, and 5th gears. This is the new position for 2nd, 4th, and 6th gears. 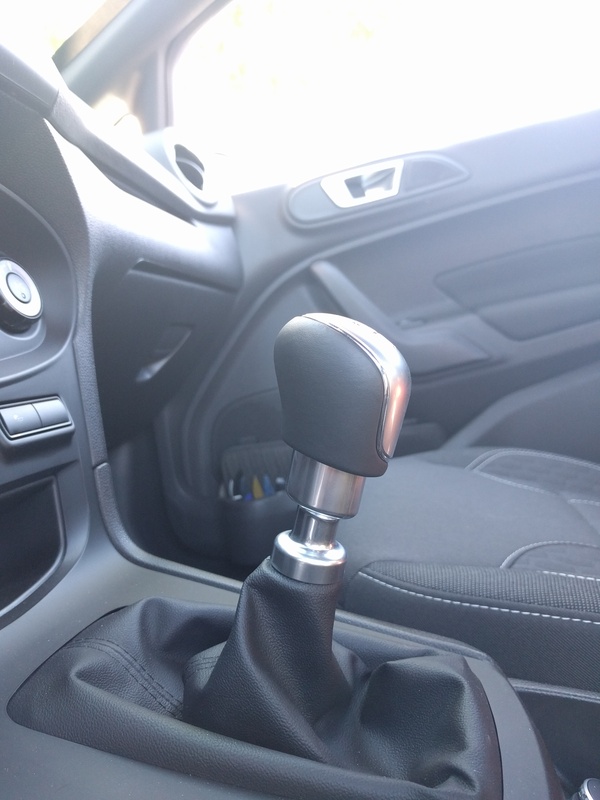 With the new short shifter installed, gear changes were vastly improved. The 25% reduction setting wasn’t too short, nor did it make any of the gears feel notchy, which is often a problem with short shifters. A quick spin around the neighborhood made us realize that the Fiesta was a lot easier to drive. 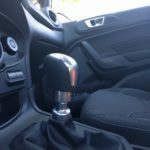 While the steering and pedal feel are naturally quick to respond, they were being hampered by the long throws of the shift lever. Now the gear throws are well matched to the rest of the car’s character. This upgrade will be most appreciated when less time is spent between gears on a nice section of twisty road. 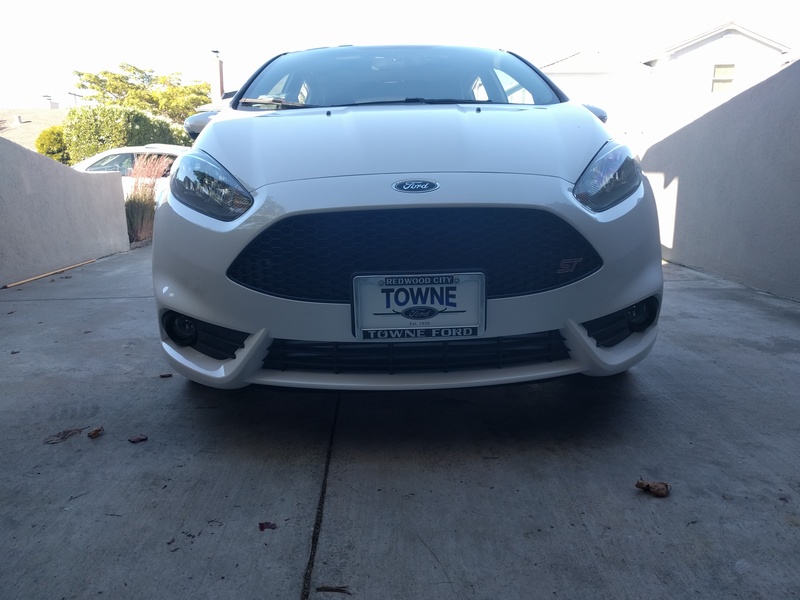 For a little less than 100 bucks and twenty minutes of our time, it’s hard to beat the instant improvement…and that everything on the car is just as clean as when it left the lot a week ago. Undo the 5 Torx screws holding the top cover of the airbox. Not completely necessary, but gives better room for the tight work area. 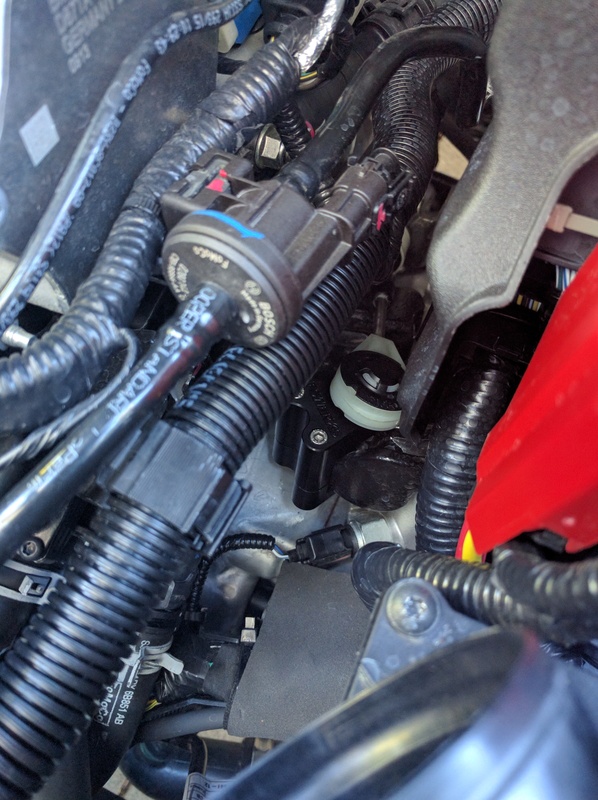 Undo the hose clamps, the MAF sensor connector, and the (3) vacuum system connectors. Now you should be able remove the entire intake tract. With the intake out of the way, locate the shift linkage and use a larger flathead screwdriver to pop the cable fitting off the transmission linkage. Open the short shift kit components and thread the pivot ball onto the larger top aluminum plate using Loctite and an open ended 11 mm wrench. There is a 15% reduction setting, and a 25% reduction setting to choose from. We went with the 25% setting. Take both aluminum plates and one of the hex bolts and loosely bolt the plates together over the existing shift linkage, with the pivot ball equipped plate being placed on top. There is a relief cut into the top plate to sit over the stock pivot ball as a guide. Take the two remaining bolts and place Loctite on the threads and screw them into the new short shifter plates. With the two bolts threaded into position, take the first bolt used as a guide and remove it to add Loctite to the threads, then thread it back into position. Now it is time to torque the hex bolts to a light 48 in/lb. You can use a 4mm hex key, but we found it easier to use a 4mm Allen key socket with an extension for a 3/8 ratchet. Clearance is tight but with carful maneuvering of the ratchet, everything can be tightened to spec without a hitch. Snap the shifter cable on the new short shifter pivot ball. Sit in the car and run through all the gears to make sure the new shift linkage is secured and works properly without any binding. If something isn’t functioning correctly, you still have the work space available to make adjustments until all components are functioning as intended. 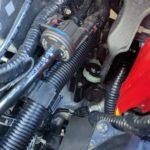 Once satisfied with the reduced shift linkage, reinstall the intake tract, airbox, and the various connectors. 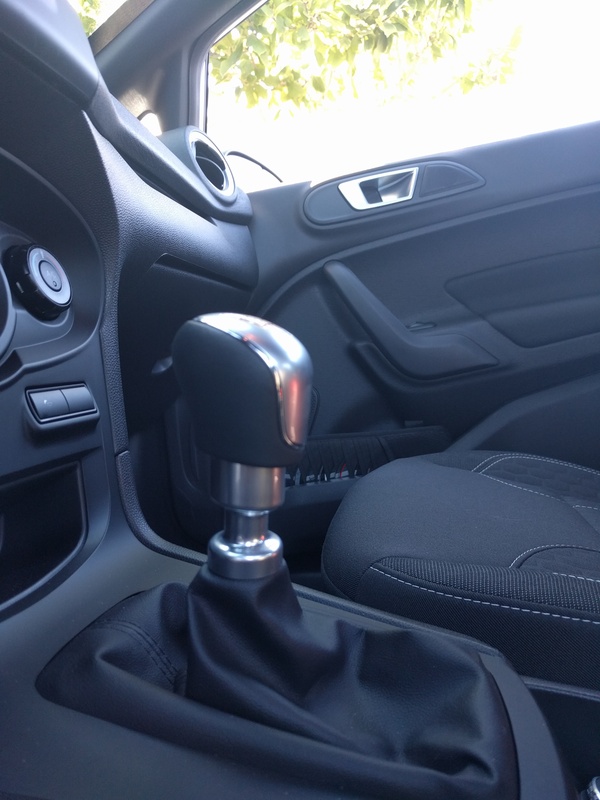 Go out and enjoy your new FSWERKS Fiesta Short Shifter on the road.